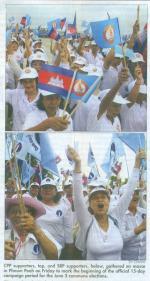 Looking at Cambodian-Thai relations: changes after the elections in Thailand? First of all: After having been away for Cambodia for about a month and not writing much – I am happy to be back since two days ago. As I had promised on 5 April 2011 that I will try to continue to report further developments in Cambodia and in India related to the respective anti-corruption legislations and their implementation – here are the newest developments from India, as reported in India Today, The Times of India, and Indian Express, about what is called the Lokpal Bill – the ombudsman bill. Not only are the activists requesting that the authority of an ombudsman has to be strengthened so that authority is given to pronounce indictments (as is the case with the Anti-Corruption Unit in Cambodia) and not only to report and to make recommendations, but the major concern is that an ombudsman’s appointment and work should be independent from government action. Having considered, in The Mirror, last week two special days of commemoration designed by the United Nations, the International Anti-Corruption Day and the Human Rights Day, we will consider today another cluster of UN Conventions, Declarations, and Days of Commemoration. This is not just to always follow such events according to the calendar. There is a very special reason to look into this context because a number of people from a mountain minority, at present under UN protection in Cambodia, are facing the danger of being pushed out of the country. Thailand's bilateral ties with Cambodia appear to have returned to normal as it decided to reinstate its ambassador now that former PM Thaksin Shinawatra has resigned as economic adviser to Phnom Penh. However, Thaksin's reasons were not altruistic - he said he could not do his duties properly because he had a lot of business to attend to overseas.